There is very little that is deemed historically significant these days, especially if it blocks the construction of high rise condos for the one percent. 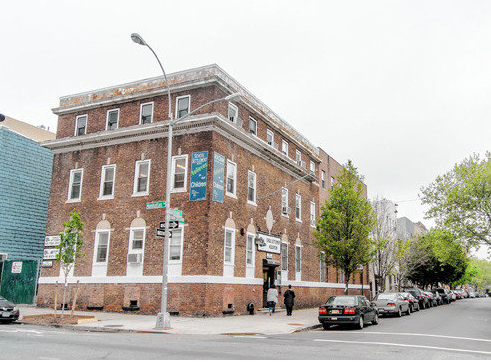 The latest historic building in the developers’ crosshairs is the settlement house at 120 Jackson Avenue, which is mentioned in Betty Smith’s sensational novel about growing up in Williamsburg “A Tree Grows in Brooklyn” Evidently the building, which has served the community since 1901 is in danger of being leveled and since it is neither a landmark,nor in a historical district it can happen quite easily. The building serves as a link to one of the great novels ever written about Brooklyn and to one of Brooklyn’s great writers Betty Smith who described Williamsburg poverty without pulling any punches. The settlement house on Jackson Avenue was started just after the turn of the century by a local principal in an effort to shield the area’s children from the effects of poverty and to teach them skills. Upper class Brooklynites volunteered in the settlement house and an anonymous donor put up money to buy the building. Born on December 15, 1896 Brooklyn, New York to German immigrants, Betty Smith grew up poor in Williamsburg and had to combine a job and school. She managed to go to Girls High School at night to complete her secondary education. One of the most formative influences on young Smith was the time she spent at the now threatened Jackson Street Settlement where she learned to sew, dance sing and where she got her first taste of dramatics. In 1943 she published “A Tree Grows in Brooklyn” and it was an immediate success that soon was made into a film. A 1945 Brooklyn Daily Eagle article described her return to the settlement house and the pride that the directress took in the success of its most famous pupil. The tree that serves as the chief metaphor for the book grew in the back of the settlement. She placed it in the back of her building, but the tree actually grew in the back yard of the settlement house. In the courtyard of the third apartment building in Williamsburg where the Nolan family lives throughout most of Smith’s novel, a tree is growing out of the cement. The opening chapter of Smith’s work explains that the tree is a Tree of Heaven. It only grows in the poorest of neighborhoods and it grows no matter how poor the circumstances. It can thrive in cement and without water or fertilizer. The tree represents the tenacity and strength of the poor inhabitants of the neighborhood, who survive with little food or money. Like the tree that receives so little care and nourishment, the people of the Williamsburg neighborhood survive and often thrive in such extreme poverty that many people live without adequate food, working only the most menial jobs, earning a pittance, and wearing threadbare clothing, through which they feel the biting cold. The people survive with the hope that the next day, week, or month, their lives will be better. No matter how badly they are beaten down, they continue to survive and they continue to hope. In the final chapter of Smith’s novel, Francie observes that the Tree of Heaven is still alive. It has been chopped down and the stump set on fire, but Francie notices that the tree is not dead. It has sent out a new branch and is surviving, just as the Nolan family has survived poverty and death and is now being given a new chance at a better life. I fear that we will quickly destroy Brooklyn’s soul and we will be left with a bunch of soulless condos. We have to preserve our history or we will be robbed of it.